Bus-1809 wrote: Cracking shot of 1424 there, Squiddy! *Tried to upload a better one... it kinda worked but not really? os91 wrote: 1744 was seen on route 114 the other day, and at Fremantle on a 148 this evening. 1178 - 80 also are back home at Freo (since Mandurah had 2906-8 delivered which replaced them). Noticed that 3034 has a ZF EcoLife badge on its rear. Any explanation as to why this may be here or any other buses have it? TP3076 was seen operating the 3:28PM 210 trip to Thornlie Station today. Bus Suggestions wrote: Noticed that 3034 has a ZF EcoLife badge on its rear. Any explanation as to why this may be here or any other buses have it? So which one did ABC Magazine use for their article? 3034 was used for the media, while 3048 was used by ABC Magazine. As people have said, it moves around under it's own steam, so there's probably not that much damage. Last edited by TP1462 on Tue Sep 04, 2018 9:39 pm, edited 1 time in total. Observation Comfort Del Gro are in transition to own Purple Coaches as getting into buses in Western Australia, they already own Swan Taxis. I know that this fact as I started working with since Monday and the transition started the previous Friday. Last edited by Transperthpaperbus on Wed Sep 05, 2018 9:55 pm, edited 1 time in total. Transperthpaperbus wrote: ...they already own Swan Transit. Rubbish. CDC does NOT own Swan Transit. Transit Systems does! CDC owns Swan Taxis, not Swan Transit. busrider wrote: CDC owns Swan Taxis, not Swan Transit. sorry I knew that, not sure why I wrote it that way. B-Series 77 was seen operating the Armadale Line this morning, departing Armadale at around 7:40AM. Told by a Railcar Driver that there was a shortfall of A-Series units. Zidanehartono wrote: B-Series 77 was seen operating the Armadale Line this morning, departing Armadale at around 7:40AM. Told by a Railcar Driver that there was a shortfall of A-Series units. 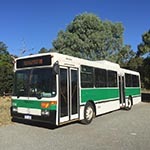 Transperthpaperbus wrote: Observation Comfort Del Gro are in transition to own Purple Coaches as getting into buses in Western Australia, they already own Swan Taxis. I know that this fact as I started working with since Monday and the transition started the previous Friday. I can double check that on Monday when I am at work. Had a ride on 1198 a couple of days ago, the windows would rattle like mad for a good 5-8 seconds after hitting a speed bump! In regards to 1198, just to answer the question, those bonded windows on the Volgren bodies have really bad flex. Saw a three-car B series on the Fremantle line today.